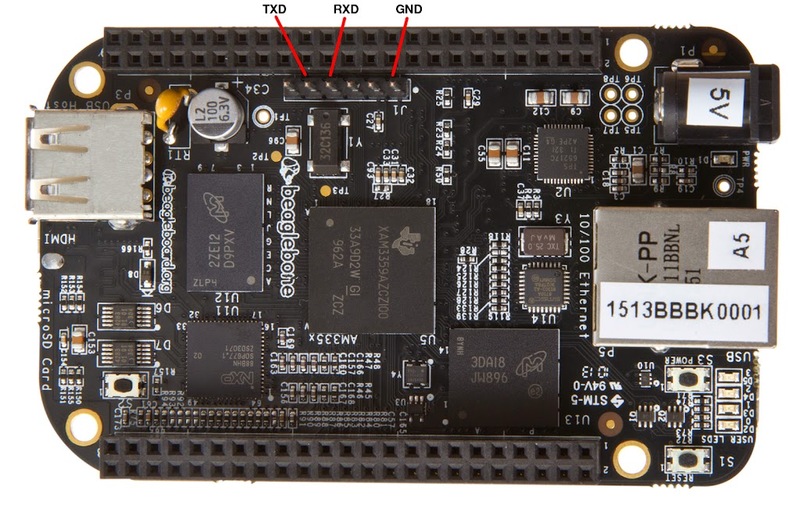 The Beaglebone Black running Angstrom has a wonderful feature: when it's connected to your desktop via the mini USB cable, you can not only mount it like a disk, but you can also set up networking to it. If the desktop is running Linux, you should have all the drivers you need. But you might need a couple of udev rules to make the network device show up. I ran the mkudevrule.sh from the official Getting Started page, which creates four rules and then runs sudo udevadm control --reload-rules to enable them without needing to reboot your Linux machine. 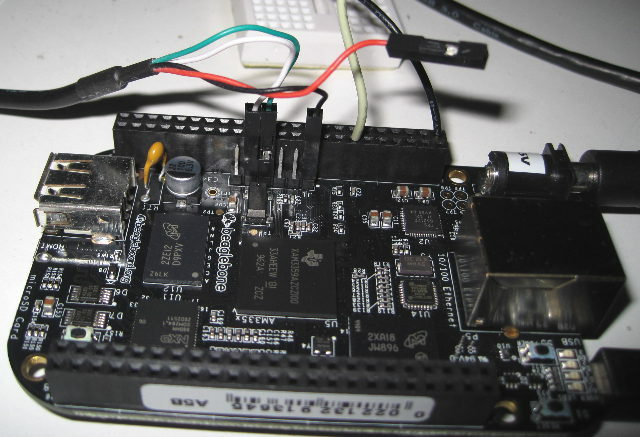 Now you're ready to boot the BeagleBone Black running Angstrom. Ideally you'll want it connected to your desktop machine by the mini USB cable, but also plugged in to a separate power supply. Your Linux machine should see it as a new network device, probably eth1: run ifconfig -a to see it. So now you can ssh from your desktop machine to the BBB, or point your browser at the BBB's built in web pages. If you want the Beaglebone Black to have access to the net, there are two more things you need to do. You'll probably want to add these lines to the end of /usr/bin/g-ether-load.sh on the BBB, so they'll be run automatically every time you boot. Now you should be able to ping, ssh or otherwise use the BBB to get anywhere on the net. Once your network is running, you might want to run /usr/bin/ntpdate -b -s -u pool.ntp.org to set the time, since the BBB doesn't have a real-time clock (RTC). If you're serious about playing with hardware, you'll probably want a serial cable, for those times when something goes wrong and your board isn't talking properly over USB. I use the Adafruit console cable -- it's meant for Raspberry Pi but it works fine with the BeagleBone, since they both use the same 3.3v logic levels. It plugs in to the pins right next to the "P9" header, on the power-supply-plug side of the board. The header has six pins: plug the black wire (ground) into pin 1, the one closest to the power plug and ethernet jack. Plug the green wire (RXD) into pin 4, and the white wire (TXD) into 5, the next-to-last pin. Do not plug in the red power wire -- leave it hanging. It's 5 volts and might damage the BBB if you plug it in to the wrong place. In case my photo isn't clear enough (click for a larger image), Here's a diagram made by a helpful person on #beagle: BeagleBone Black serial connections. I used the serial monitor while flashing my new Angstrom image (which is how I found out about how it spends most of that hour updating Gnome desktop stuff). On the Raspberry Pi, I was dependent on the serial cable for all sorts of things while I worked on hardware projects; on the BeagleBone, I suspect I may use the USB networking feature a lot more. Still, the serial cable will be handy to have when things go wrong, or if I use a different Linux distro (like Debian) that doesn't enable the USB networking feature.